Are we ready for Hybrid Car? 1) Does all the workshop know how to repair hybrid car? 2) How much does the battery cost to replace? 3) Is the maintenance high? These is what i can think off, I’m thinking what car to get next? Hybrid or non-hybrid. For time being there is not much choices for Hybrid, only Honda and Toyota having Hybrid. Hybrid also have many variant, for Toyota Prius is the 3rd Generation Hybrid is a Series-Hybrid, it run on electric during startup and even when cruising but Honda Civic is Mild Parallel Hybrid where it run on electric when acceleration pedal are release and almost going to halt state. Since we only have 2 choices the price is still consider high compare to others country, how soon will our car maker come out with Hybrid car? I really hope to get an Hybrid car but can’t afford at the moment, hope that more car maker bringing in more choices for us. For those who not sure what is Hybrid car all about, you can check it out here. When I was on my way back to office after done an installation in Bukit Jelutong by passing Old Klang Road via NPE, where I almost reach Pearl Point I saw this car and look very nice from front and back. I just wonder what car was it and from the logo I’m not sure what car was it. I didn’t manage to see the front clearly as i just by pass it when this car turning to OUG. Anyone know what car is this? I manage to found the catalog for the new Honda City 2009 and you can get the catalog from the link below. I’m quite interested on the new honda city and can’t wait till it launch, I’m going to test drive it once it launch in KL and see how it perform since the car wheelbase have been widen 100mm. This seem the car is bigger then the current city and should be more confortable. Anyone have any idea how much would it going to be? Oh man…I have fall in love with it. Honey can we get it 🙂 ? Take note as this catalog is from s’pore. Hey guys, its confirm the new Honda City 2009 will be release soon as its been spotted in China and India. These photo is not known where its been taken. The interior design is different from Jazz as it might use cheaper material to cast and manufacture simpler design. Wow this is really interesting that China car manufacturer is going for Hybrid technology as they know the problem with Global Warming. Our local car manufacturer seem does not really car about it and local authorities should start think about it now since it getting worse if we all still carrying the attitude of “don’t care”. Although it was not in the market yet but they have this intention and if I not mistaken few years back on our local Autoshow I saw a prototype of Perodua Kenari equip with Hybridengines but dunno where does this prototype goes. I do know that current Hybrid car is very expensive but all the car maker bring into malaysia it might cut down the price or maybe they are waiting for open market. When will this going to be happen open market? Frankly speaking I does not have confident on china made product but somehow they really improved on their technologies. Today I changed my car original exhaust manifold to extractor cause the manifold broken. I just wonder how could the original manifold can be so easily broken and I only found out from Din (exhaust shop owner) said the mounting kit for the original manifold have been removed. I think last time i send my car to workshop when my timing belt torn that time the foreman forgot to put it back, damn it cause me fly 160 buck and my car sounds like Harley Davidson. I changed the extractor in Sunway and the shop name called Wai Heng. If you’re coming from Sunway College to sunway industrial area where there is a lot of shop doing the car modification, turn right at the traffic light and you can see the shop on your left hand side. Bravo brother, your dream’s really come true. 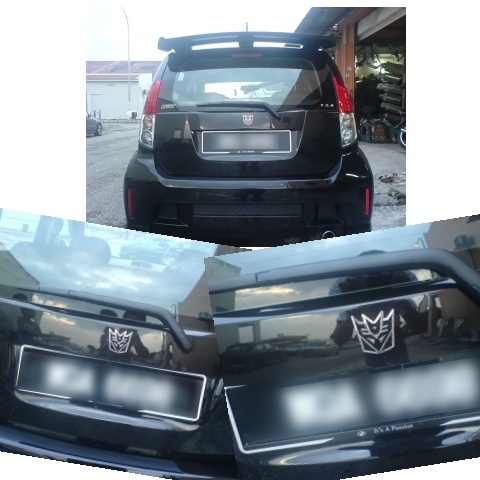 You really ask the workshop to fix the “Transformer emblem” behind your Myvi. It really look great and worth for the money you pay for… 🙂 1 thing is dunno JPJ will kacau or not? Hopefully no problem on that. 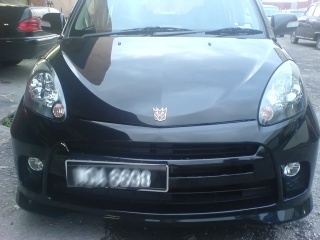 27-07-07 – Myvi with Transformer emblem.